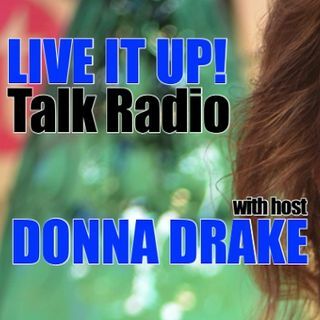 Live It Up with Donna Drake is a weekly radio show celebrating the concepts of hope, motivation and inspiration. Donna Drake consistently embraces the essence of life and shares stories with the audience on how to live life to the fullest. Each week features a theme around a Live It Up Tip for the Day (LTFTD) as well as informative guests from all walks of life. Celebrities, businesses owners and non-profits join in the conversation. Donna is an ardent supporter of the ARTS, she showcases ... See More talent from around the globe featuring songs, poetry and other artistic expressions that uplift the human spirit.